Gosh, how long has it been since I managed an outfit post on a Tuesday?! It's not much, I managed to get Jon to snap a quick photo before we raced out the house to go our separate ways to work. Today I decided to dig out one of my printed mini-dresses (boy, do I have a lot of those!) 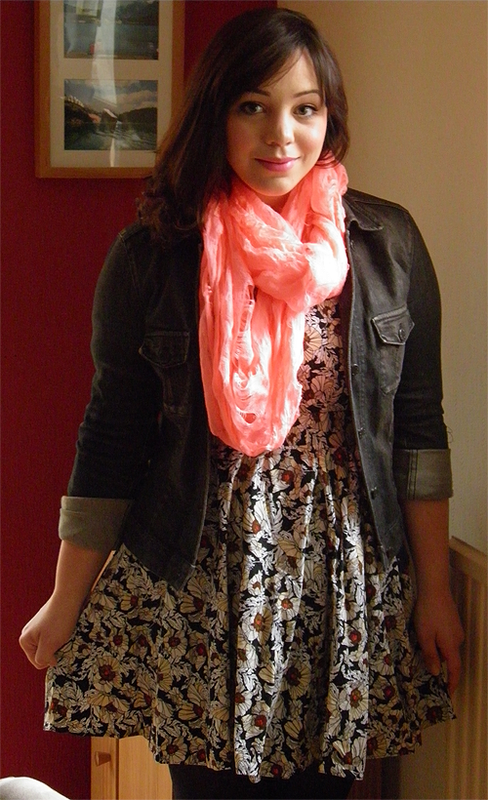 with this flowery number from Dorothy Perkins (where else?). I teamed it with my favourite coral scarf from River Island, as well as my trusty denim jacket and a hidden cardigan underneath (despite joyful weather forecasts, it was FREEZING this morning!). I whipped the tights off as soon as I got home though, as it was so gorgeously warm! Feels like summer has finally shown its face, I'm so happy! Hope you're all having a lovely week so far! I'm planning a few beauty posts so that I can post more during the week. I've taken to writing them up on my phone app and taking photographs when I get home, so long as the light is forgiving enough, of course! Love this outfit! The dress is gorgeous. Love the print on the pretty dress Dani!